Find the best online gambling sites in your country. Search our site Search Please enter some text before you try to search. Stake £10 cash or more on Casino slots and make your prediction during the relevant qualifying periods. Free Spins will be credited to winning players within 24 hours. Time limits, game restrictions and T&Cs apply. Subscribe to our newsletter to learn about the latest online gambling bonuses and online gambling promotions. Play with 1xGames and win an iPhone XS! Fancy yourself as a Soccer expert? Enjoy the Champions League action in two great matches by predicting the correct result and getting up to 30 Free Spins. Stake £10 cash or more on any slot game at bet365 Casino and make your prediction during the relevant qualifying periods. The first promotion period runs from 09:00 GMT until 20:00 GMT on the 12th March 2019 and is available for the Juventus v Atletico Madrid match only. The second promotion period runs from 09:00 GMT until 20:00 GMT on the 13th March 2019 and is available for the Bayern Munich v Liverpool match only. 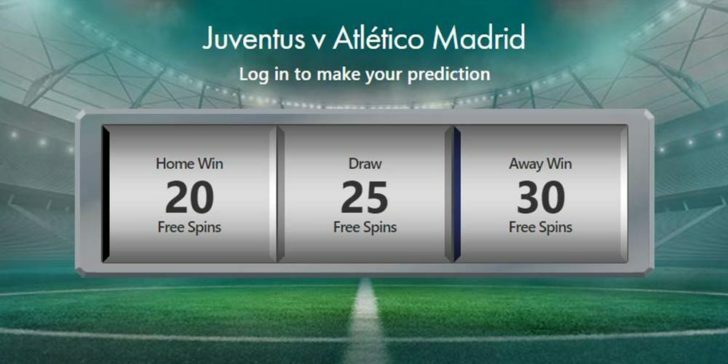 Correct result predictions for the Juventus v Atletico Madrid match can only be submitted during the promotional period and must be made before 19:30 GMT on 12th March 2019. To make your prediction eligible you must stake £10 cash or more on Casino slots before 20:00 GMT on12th March 2019. Correct result predictions for the Bayern Munich v Liverpool match can only be submitted during the promotional period and must be made before 19:30 GMT on 13th March 2019. To make your prediction eligible you must stake £10 cash or more on Casino slots before 20:00 GMT on 13th March 2019. Stakes made after 20:00 GMT on 12th March 2019 will not count towards the qualifying wagering requirement for the Juventus v Atletico Madrid. Stakes made after 20:00 GMT on 13th March 2019 will not count towards the qualifying wagering requirement for the Bayern Munich v Liverpool match. Stakes made in one promotion period do not contribute towards any subsequent promotion period. You are only eligible to make one correct result prediction for each featured match. Predictions can only be made at the top of the promotion page. You must be logged in to your Casino account to be able to make a prediction. Once you have submitted your prediction it cannot be amended. Free Spins awarded as part of this promotion will be credited within 24 hours of the end of the featured match and must be claimed within seven days. Any unused Free Spins will be removed along with any winnings accrued within seven days of claiming. Free Spins awarded as part of this promotion can only be played on the following slot games: Age of the Gods, Frankie Dettori’s Magic 7 Jackpot, Frankie Dettori: Sporting Legends, Age of the Gods: Furious 4, Halloween Fortune, Age of the Gods: King Of Olympus and Zhao Cai Jin Bao. For more information about all offers please visit the bet365 website. Check out the latest online sportsbook promotions in the United Kingdom! To learn more about the best Online Sportsbook Sites in the United Kingdom, have a look at the Online Sportsbook Reviews section. To read other promotions please check online promotions page. Glenn Close Oscar Betting Odds: Will She Win Her 1st Oscar by the End of the Year 2023? The articles published on our site are meant only as an informative entertainment and we at GamingZion are not liable for any losing, or indeed winning, wagers placed (or any other gambling activities undertaken) as a result of acting upon the opinions or views of our contributors.